Christmas is right around the corner, and whether you’re visiting family for the holidays or entertaining in your own home, you’ll want to make sure to create a relaxing space for both you and your guests. And while most people’s first thoughts land on updating the living room or kitchen, the bedroom (and guest bedroom!) is just as essential to completing your home’s welcoming vibe. So, this month, I’ve put together a style guide to help you prep your bedrooms for the season – because we could all use a bit more hygge in our lives, wouldn’t you say? Happy holidays – may your home be filled with plenty of coziness and cheer! Your bed should be the most comfortable spot in the house – after all, it’s the one place where you can rest and recharge after a long day of cooking and entertaining family and friends. So, to make it the ultimate relaxation destination, remember to layer, layer, layer! Use a variety of textures and patterns together to create depth and dimension, and don’t be afraid to mix and match several different pillow sizes. Just be sure to keep your color palette to about three colors that complement the rest of the space – this allows you to play with different shades, but still keeps the room’s vibe feeling cohesive and planned. I can’t stress enough the importance of good lighting in the bedroom. Instead of relying only on overhead fixtures, you absolutely need a variety of light sources to keep things feeling soft and inviting. 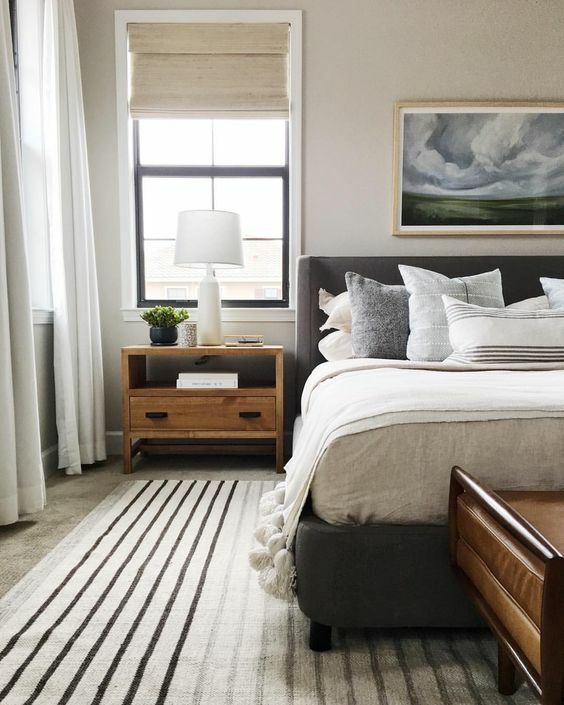 Bedside lamps are a must for late-night reading or for adding more of a calming glow to the space – just make sure that when you choose your lamps, the top of the shade hits just between your headboard and the tops of your pillows, and that the size is proportional to your room’s furniture. Your bedroom’s artwork should be intentional and reflect your home’s personality. Think about what makes you happy and use that as the starting point for your décor. Is it a framed print? A group of matte family photos? Maybe a collection of tchotchkes from your vacations over the years? From gallery walls to floating shelves and stand-alone paintings, adding pieces that bring you joy instantly help to bring the room to life. And remember that not every wall surface has to be covered. Quality is always better than quantity - a few strategically-placed items will make all the difference! The key to a clutter-free bedroom is incorporating plenty of storage. Dressers – like this gorgeous and sleek white piece – help to keep things neat and also provide a handy surface to display favorite items or fresh flowers. Nightstands, too, are key to clean and clear bedrooms – make sure you’re choosing ones that have either shelves or a drawer or two so you can keep items like your phone, a book, and your glasses within easy reach without having to pile it all on top of one another. Also, keep in mind that when you’re choosing your bedroom furniture, you should go for complementary, but unique, pieces. If everything is too matchy, your bedroom will feel sterile. Instead, opt for an eclectic and lived-in look – you’ll up the cozy factor in no time!